Dubois County residents age 55 and older can enjoy the many activities offered at the center. 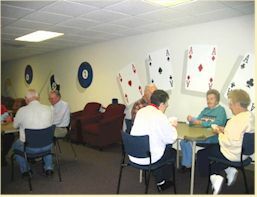 Located in the beautiful home donated to the City of Jasper by Mrs. Barbara Habig and her late husband, Arnold F. Habig, many seniors enhance their lives through daily use of this beautiful facility. A wide variety of passive and active recreational activities are available on a daily basis at the Arnold F. Habig Community Center. Some include: Exercise Classes, Bingo, Guest Speakers, Book Club, Catered Meals, Day Trips and a Computer Lab. We have card tourneys Thursday afternoons and play Cinch, Sheephead, Euchre or Rum. Tripoley, Mexican Train Dominoes, Pay Me and Hand & Foot are just a few of the other games played. In addition, many visitors utilize the exercise room which includes: 3 Treadmills, 2 Recumbent Bicycles, 2 Ellipticals and a Cybex Weight Machine. An indoor walking area is also available for walkers during cold weather. A cedar walking path around the perimeter of the property is also available for walker's enjoyment. You may pick up our monthly calendar at the center or you can view it on the park departments home page under recent news. The City of Jasper partnered with Ride Solution in 2008 to help meet the transportation needs of the community. Ride Solution is a coordinated public transportation service that provides safe, dependable, and affordable transportation. The vans are clean, smoke-free and many are wheelchair accessible. All drivers are specially trained, and courteous. Hours of operation are Monday through Friday 6:00am-6:00pm.